ATLANTA HT-high-torque worm gear units have been specially developed for use with the latest three-phase and DC servo-motors. Like all other components in this catalogue, they are usually available ex stock or, at least, within a very short time. • robust bevel roller bearings for the output drive hollow shaft in “O” arrangement permitting greater additional forces. For many decades standard worm-gear units have proved their efficiency regarding reliability and long service life in many machines. Further advantages are the low noise emission as well as their dampening effect upon the entire drive line. As angular gear units they are very space-saving. ATLANTA has 2 different types providing inexpensive solutions for standard applications. ATLANTA worm gear motors – a new combination between the known high-quality standard worm gears with hollow shaft and robust three phase asynchronous motors. Gear ratios from 6.75-82 in 6 gear sizes cover a power range from 0.12-11 kW. The cast iron casings of our heavy-duty gear unit series which are machined on all sides and the ingot-cast light-metal casings of our light-duty series are provided with many pre-drilled mounting and threaded holes so that they can be easily installed or mounted in any position desired. Due to their shape our gear units can even be used as a load-bearing structural element. High-quality spiral bevel gears with palloid teeth, which are heat-treated or hardened, or, in the case of spirals, lapped in sets, ensure an excellent load bearing capacity and smooth and silent running. The permanent oil-bath lubrication – to be checked by means of a sight gauge – guarantees a long service life and, under normal operating conditions, renders an oil change superfluous. Carefully installed shaft seals protect our gear units against oil leakage and the penetration of dust. Any radial and axial thrust developed is safely absorbed by amply dimensioned antifriction bearings. The angular position of the keys relative to each other is not fixed. The advantages of the spiral-tooth bevel gear drive (within our ex-stock product range provided with palloid tooth system) are in particular its reliable handling of high speeds. Due to the high contact ratio of the palloid tooth system, especially of our gear units of the "heavy-duty" series, a maximum of smooth and quiet operation is ensured. 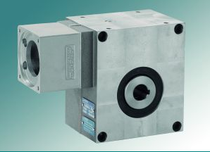 The High-Performance (HP) Series is the original Servo-Worm Reducer, available in five sizes (50 mm to 125 mm center distance) with a backlash level of less than two arc-minutes. 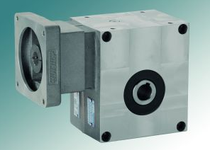 The High-Torque (HT) Series offers 150% the torque capacity of the HP Servo-Worm Reducer, while reducing the backlash level to less than one arc-minute. The output was also redesigned for increased bearing capacity and an option for ISO 9409-1 flanged connections. The Economy (E) Series offers the same torque capacity as the HP Servo-Worm Reducer, with a fixed backlash level of less than six arc-minutes. A simplified housing and assembly allows for significant price savings. 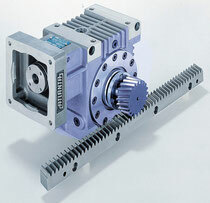 The Bevel-Gear (BG) Series offers high-efficiency servo operation with a backlash level of less than six arc-minutes. Available in three sizes with ratios from 4.75:1 to 9.25:1. Click on the "Version" name to view PDF file on specific unit; click on the "Torque Capacities" of unit to view full unit ratings. Capacities up to 885 lb.ft. up to 1,143 lb.ft. up to 590 lb.ft. up to 531 lb.ft. up to 332 lb.ft. The mounting faces of the HT, HP, E and B versions are identical, making it possible to interchange a unit with a higher or lower accuracy unit if needed. A wide range of motor couplings and mounting flanges are available for the complete reducer range to mount virtually any servo motor and the hollow bore output can be used to mount output shafts, pinion shafts, or other drive elements.